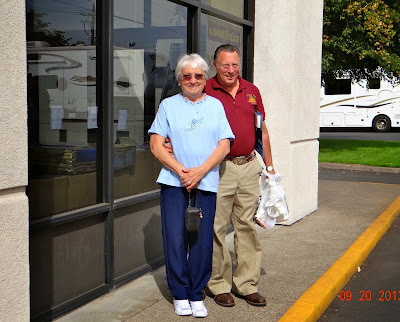 Yesterday my new friends, Betty and Joe, arrived at 10 to take me to Camping World in Wilsonville. 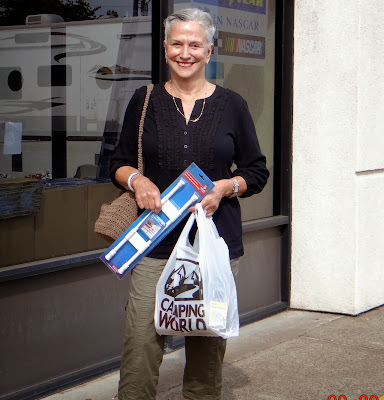 They had several items on their 'to buy/shop/do' Camping World list, as did I. 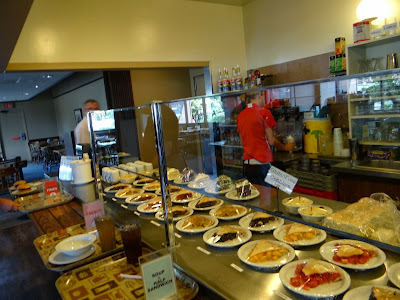 On the short ride to Wilsonville the three of us jabbered and jabbered - getting to know each other - over and above our blogging friendship. I love meeting new best friends and Joe and Betty are definitely that! A lovely couple, who, between them have, I think I remember correctly, 8 children, 16 grandchildren and 3 or 4 great-grandchildren! And, here I am after picking up a few things, including a battery tender for Petunia to trickle charge the battery while it's disconnected for towing. The service department gentleman actually walked me out to talk with the man who has installed tow brackets on 8 or 9 Smart Cars. I told him the abbreviated version of my travails. He'd not had any reports of similar occurrences with any of the installations he's made. One suggestion he and the service manager gave me is: from time to time, when I stop at a rest area, it might be a good idea to go back to Petunia, reconnect the battery, start her up and let her idle for a few minutes before going through all the pre-towing steps to tow again. Neither had any information about the bungee cord application; so, I'm still a little ambivalent about trying it. 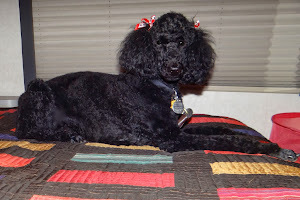 I plan to hook Petunia up and tow her around the park today to see how she does - I'm still apprehensive. Can you tell? After our sojourn at Camping World, Betty and Joe asked if they could treat me to lunch at one of their favorite restaurants .... Tébo's on McLoughlin Blvd (that's 99E) in Gladstone. 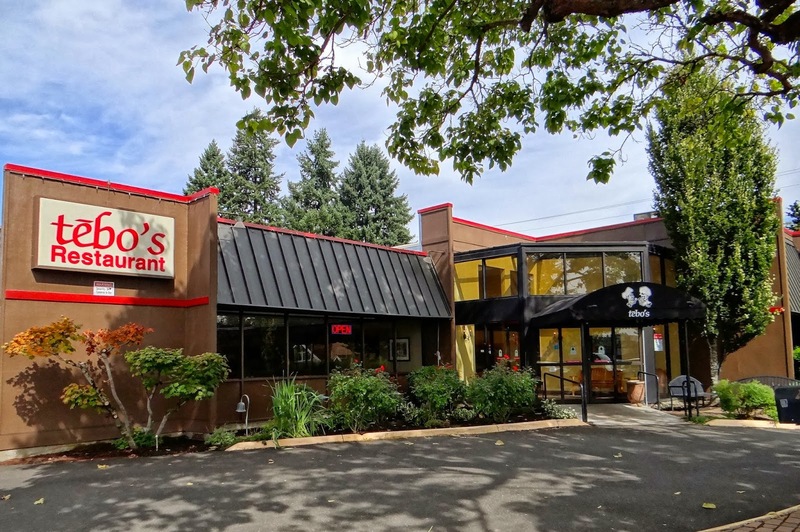 Nice exterior - big parking lot - good indication of popularity! 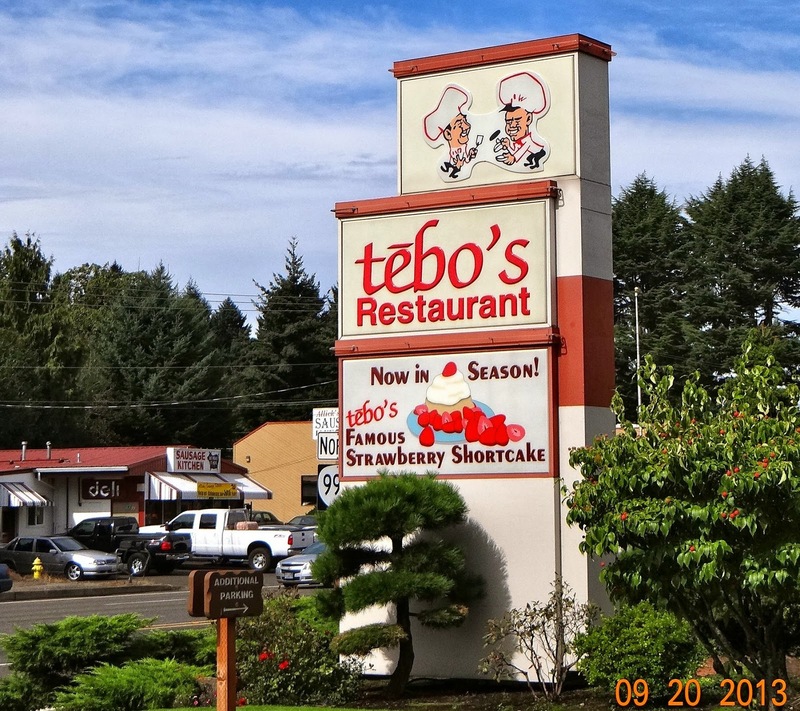 Tébo's has been a family favorite restaurant in the Portland area since 1954. Joe introduced me to one of the owners, Craig, who's been with them since 1974. 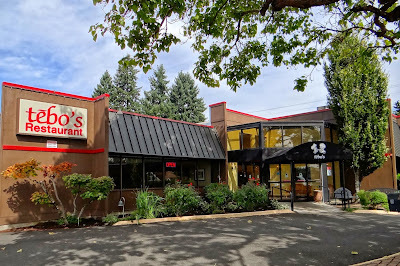 It's one of those places where I suspect a native Oregonian always 'runs into' a friend dining there. 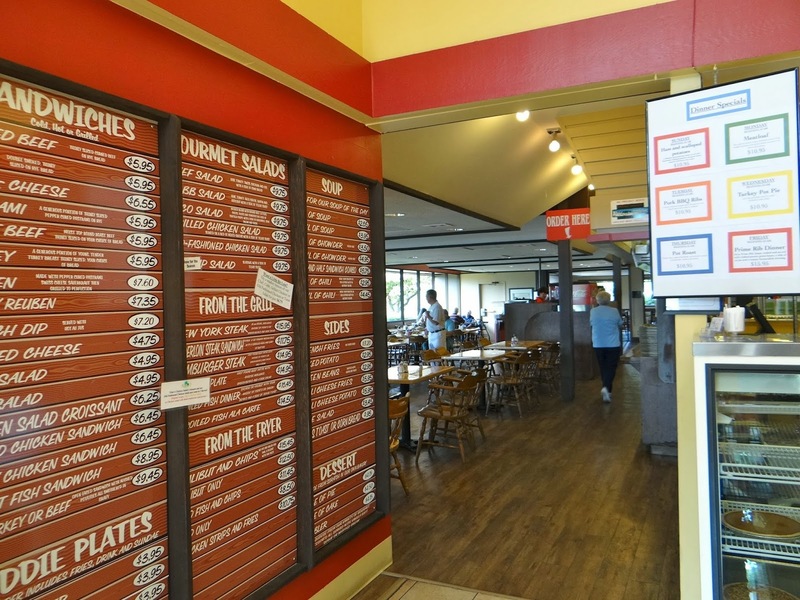 At the entrance one sees the extensive menu - it's a cafeteria-style eatery; however, one walks the line with a tray and a server takes the order and places a small placard on the tray for each item desired. Everything is freshly cooked and served by a waitress at the table. 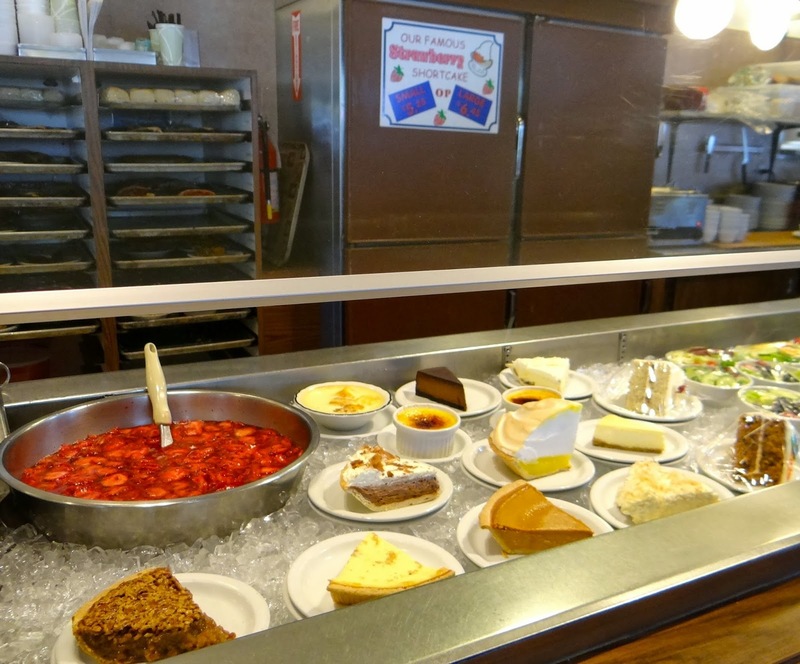 There are a few salads and desserts ready. But, for instance, I HAD to try the strawberry shortcake, so the server placed the serving dishes for it on my tray, but it wasn't actually prepared until I asked the waitress for it at the completion of my delicious French Dip sandwich. Probably 15 choices of freshly-made pies and cakes. 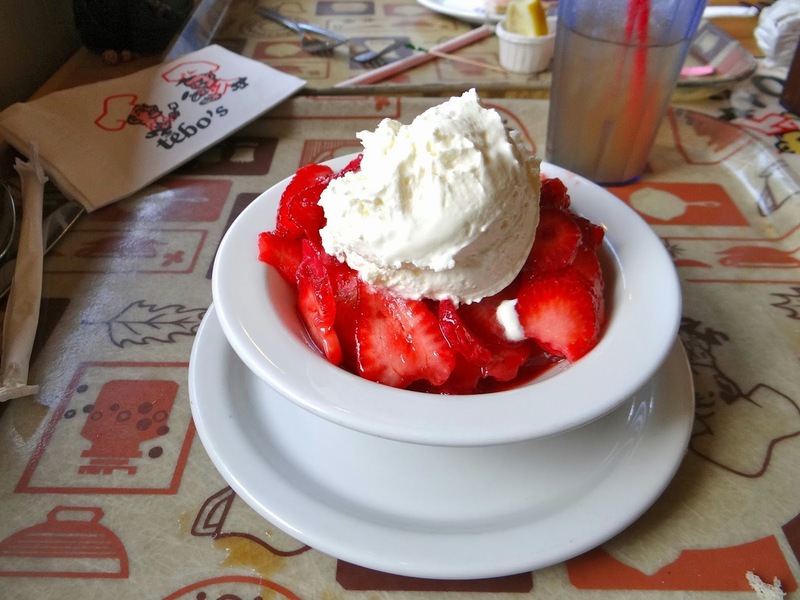 I just couldn't resist - Strawberry Shortcake supreme with homemade whipped cream. Joe also had one, with vanilla ice cream. Yum! After a fun-filled several hours with my new friends, I returned to Floribunda and found that I'd left the stew simmering!!! Yikes, am I lucky - no burning but very tender! 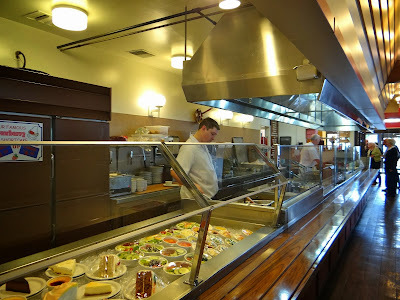 I had no desire for dinner until about 8 hours after that luscious lunch. What? A dental office? 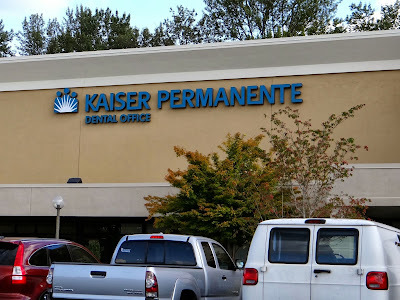 We surely don't have Kaiser-owned dental offices in California. No flu shots to be had here, maybe I could have my teeth cleaned!!! 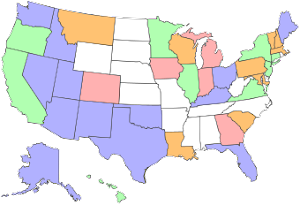 Wow!This place is really cool.To keep such places disciplined and good, quick motorcycle towing vancouver and also other roadside assistance towing service is really great.